A preventive program is a cooperative effort by patient, dentist, and dental staff to preserve natural dentition and supporting structures by preventing the onset, progress, and recurrence of dental diseases and conditions. Prevention includes regular dental exams, cleanings, and x-rays. Sealant and fluoride treatments are additional measures that may be taken to protect your teeth. Are you kept awake at night by someone who snores? Or do you keep someone awake, because you snore? It’s true that it is not your fault. If you snore, it is not because of anything you have done or not done. The noise is caused by air passing through narrow passageways, as you breathe. These are the normal passages of your throat, but made narrow because of the position of your jaw. A snoring aid simply keeps your jaw moved forward a bit, so the passages are big enough for air to pass noiselessly. Most people fall asleep easily and do not notice during the night that they are wearing the device. To understand how snoring happens and how the aid works, watch this Silent Nite® video. This device is a great improvement on the desperate measures people have taken in the past – breathing masks and even surgery! If you have any questions about anti-snoring devices, feel free to contact us for a free consultation! The key to keeping teeth and gums healthy for a lifetime is regular dental checkups and cleanings. Just like your car, your teeth need maintenance in order to function well for years. At Premier Dental Concepts, we take dental checkups and cleaning very seriously. Our three-step procedure helps us find and deal with any dental situations before they become big (and expensive) problems. If your dentist did not use an x-ray machine, he would miss hidden decay until it had progressed far enough to be seen (or even felt). We x-ray your teeth on a schedule found to work for most patients. If you skip a scheduled x-ray or two, a cavity may get big enough that you need a crown instead of just a filling. In addition to looking for tooth decay, we x-ray to find tumors, cysts, or bone loss, as well as to record the position of your teeth and their roots. Since x-rays can be dangerous to your health, you are protected by a lead apron, and it is important that the top be pulled up around your throat, as well as covering your chest. However, the modern x-ray machine used by Dr. Wojtkun gives off much less radiation than the older types. We also use a digital x-ray machine, with the least possible radiation. This technology has the advantage of producing digital images that can be viewed by you on a chair-side monitor. The images can also be transmitted digitally to another specialist or to a lab, and they can be printed out. Let us know if you would like to keep a digital or printed copy of your dental x-rays. Your twice-a-year dental checkup and cleaning is the foundation of your dental care. Even if you take excellent care of your teeth and gums in between, some bacteria will stick and form a substance called plaque. If any of this is not removed, it turns into a harder material called tartar (or calculus). Your dental hygienist is the expert at removing plaque and tartar, by a process called scaling, which means removing plaque and tartar using dental instruments. After the hygienist has cleaned your teeth, she will polish them. A good professional polishing removes surface stains and remaining traces of plaque. An examination is made of the “pockets” between your teeth and gums, using a periodontal screening and recording probe. Ideally, gums should be tight around the teeth they support, but accumulated plaque and tartar at the gum line creates toxins as well as physical friction, forcing your gums away from the teeth. If a pocket is greater than 3 mm., the hygienist will advise you, as this indicates gum disease. In general, the deeper the pocket, the more advanced the gum disease. A second tool we use for examination is the intra-oral camera. We can show you real-time video of the inside of your mouth on a monitor. If there are problem areas, we can point them out and discuss ways to correct them. Cancer screening is an important part of the examination. Who better than your dentist to check your mouth for cancer? He’s already in the neighborhood, so he checks your face, neck, lips, tongue, throat, cheek tissues, and gums for signs of cancer. Finally, Dr. Wojtkun carries out the traditional dental examination, with probe and mirror. There is no substitute for the visual observation of a trained dentist who knows what to look for. He checks all your tooth surfaces for decay, your gums for signs of periodontal disease, and your existing restorations, such as fillings and crowns. The American Dental Association (ADA), the Occupational Safety and Health Administration (OSHA), and the Center for Disease Control (CDC) all have recommended safety measures for dental offices. To ensure the safety of our patients, Premier Dental Concepts complies with all and keeps updated on any new standards. One of the earliest lessons most of us learned was how to brush our teeth. Our parents may have reminded us that we only get one practice set, our baby teeth, and that when permanent teeth start to grow in, each one has to last a lifetime. Here are some tips for taking care of those precious teeth and gums, in hopes that they last you a long, long time. If your bristles fray and wear out sooner, replace the brush even if it hasn’t been three months. Eat healthy foods full of nutrients. After lunch and any between-meal snacks, brush your teeth or chew some xylitol gum. At the very least, rinse your mouth. 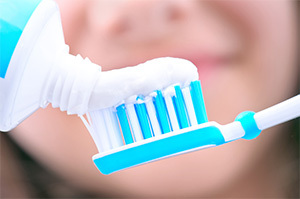 A mouth wash may be helpful to limit the bacteria that build up into the sticky film called plaque. Visit your dentist regularly, preferably twice a year, for a professional cleaning and a checkup. The areas between the teeth and at the gum line can form traps for food particles and plaque. Tools you can use to clean here include dental floss and interdental cleaners. Some people have large gaps between teeth; a tiny brush designed for this purpose will fit those areas nicely and keep them clean. Ask Dr. Wojtkun or one of his dental hygienists to recommend a device that will work for you. The hygienist will demonstrate exactly how to use it. The same tools that you use to clean between your teeth will help you keep your gums in good health. Floss removes the bacteria build-up (plaque) from the gum line area. When this is clean, the gums can cling to the teeth in the way they are designed to. In addition, floss stimulates the gum tissue to increase blood circulation. Interdental cleaners of various designs also perform these functions. A rubber-tipped dental device is excellent for stimulating gum tissue. There are wonderful aids available today that might make your dental care a little more care-free. Electric toothbrushes are available in many styles, some with sonic wave assistance. Water pick devices shoot a jet of water in between teeth and between gums and teeth. We will be happy to help you find the tools you need to care for your teeth properly. You can find more information about home dental care from the American Dental Association. 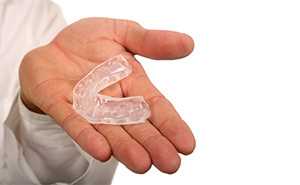 Both mouth guards and snoring aids take the form of thin plastic formed to the shape of your teeth, similar to at-home whitening trays. In both cases, your dentist takes an impression of your teeth, which he sends to a dental lab for the fabrication of a custom appliance. A night guard is a mouth guard for people who grind their teeth or clench their jaws at night, while they are sleeping. This behavior is called bruxism. A person may not even be aware of doing this, but their teeth will be worn down from the constant friction. Sometimes teeth can even be cracked or fractured from the stress. Research studies indicate that grinding and clenching one’s teeth may result in eighty times the average daily tooth wear. A night guard is a plastic appliance – a thin form – that just fits over either the top or bottom teeth and keeps the teeth from being able to make contact. It is simply impossible to grind your teeth while wearing this appliance. In addition, it provides a little cushion so that clenching the jaw does not exert so much force. However, there are other causes of TMD, so a proper diagnosis is important, possibly involving x-rays or a cast of your teeth to see how they fit together. For night guards, Dr. Wojtkun provides Comfort H/S Bite Splints. If you play sports, or your children do, take the time to watch this PlaySafe Video. The statistics tell the story. Between amateurs and professionals, athletes lose more than five million teeth per year. Just as you wear a seat belt so you don’t become one of the driving accident statistics, wear a mouth guard during sports. It’s one of the best investments you can make, because these are the only teeth you get. We are not lizards and cannot grow new parts. You can, of course, find off-the-shelf mouth guards that are better than nothing. However, they can never fit as well as a PlaySafe guard custom made for you. When your mouth guard fits properly, you forget you are wearing it, so you can concentrate on winning the game! If you have children, it is doubly important to have a guard custom made, because kids just won’t wear uncomfortable gear. According to research statistics, when mouth guards are actually worn and fit properly, risk of injury can be reduced by up to 99%. If the tooth is dirty, rinse with water only. Do not scrub, dry, or wrap it. Do not allow synthetic materials to touch it. Attempt to fit the tooth back into the socket. If you are successful, hold it there with a finger. If the tooth cannot be fitted back into the socket, store it in water, adding a bit of salt for preservation. Get the patient and the tooth to a dentist or endodontist as soon as possible, within a few hours. If you are near our office, call (978) 475-1030 immediately. If you have any questions about mouth guards or any of the conditions described on this page, contact us for a free consultation! The word periodontics comes from Greek words meaning around tooth and refers to the study and care of tissues that support the teeth, namely the gums with their supporting bones and ligaments. Periodontal disease, or gum disease, can sneak up on you, because it does not announce itself with great pain or obvious symptoms, at least not in the early stages. However, if you learn the symptoms and watch for them, you have a better chance to keep your teeth. Naturally, the first thing that comes to mind in regards to periodontal or gum health is its impact on overall oral benefit. 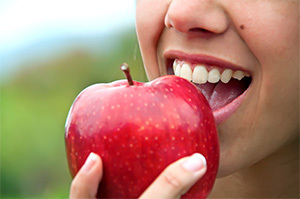 Healthy gums go hand in hand with healthy teeth. Clean pink gums have more of an impact on your overall health than just dental well-being. Oral health is often a roadmap to overall health, and the presence of periodontal problems often signals other potential medical and dental concerns. For example, the presence of periodontal disease is linked to heart disease, as well as diabetes and certain types of cancer. Dentists are often the first health professionals to notice the telltale signs of these health problems. The importance of gum health can’t be overstated. While gum disease may be an indicator of serious health issues, it is often a cause of preventable dental and health problems. People who make gum health important stand a better chance of preventing mouth and face pain associated with tooth loss and gum pain, problems with the major organs, such as the heart, due to bacterial infection affecting the heart valves, and digestion problems as related to IBS and other digestive complications. 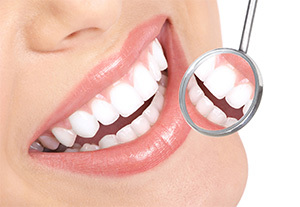 In short, your gum health is a high priority for your dentist, and should be for you as well. Teeth loosen and fall out, not so much because of tooth decay, but because when gums become infected, they no longer keep their natural grip on the teeth. Bacteria grow on your teeth, attracted and fed by food residue. The sticky film called plaque that you brush off with your toothbrush is composed of these bacteria. Very quickly, within a day, the acids in your saliva act on the dead bacteria in plaque, hardening it into tartar or calculus. This is an abrasive material that irritates your gums and breaks the seal between gums and teeth. Bacteria can enter the gap, and they produce toxins that further irritate gum tissues. In addition, these same bacteria will now be able to enter your blood stream, and there is a possibility that this may affect your health in other ways. Research is ongoing to determine the connection between periodontitis and such diseases as strokes, bacterial pneumonia, diabetes, cardiovascular disease, and increased risk during pregnancy. Eat healthy foods to get adequate nutrition. Cut back on your use of tobacco. Avoid teeth grinding and clenching. In addition to looking at the same symptoms that you can see or feel for yourself, we perform a special test during your dental exams. With a periodontal probe, we measure the depth of the pockets between your teeth and gums, at every point where they meet. If the measurement is more than 3 millimeters, we know that is an area to watch. If you have spots that are 4 millimeters or more in depth, ask your dental hygienist what you can do to take better care of your gums in that area. A dedicated flossing regime can lead to a lot of improvement very quickly. The routine scaling procedure that is done by the dental hygienist removes built-up tartar that can cause gum disease and that can only be removed with dental instruments. This gives you a clean mouth and a chance to improve your oral hygiene in the future. For more advanced cases, we can do a deep cleaning, otherwise known as root scaling and planing. This is simply a more thorough removal of a large amount of tartar build up, both at the gum line and beneath the gum line, on root surfaces. If you are concerned about the health of your gums, call us at (978) 475-1030 and ask for a check-up appointment. The actions you take now may end up saving some of your teeth! A dental sealant is one of your dentist’s oldest tools for preventing tooth decay on the chewing surfaces of the back teeth, the molars and pre-molars. In a simple procedure that takes only a few minutes per tooth, the teeth are first cleaned, then etched with a mild acid so the sealant will stick to the teeth. A liquid plastic resin is painted onto the top surface of each tooth to be sealed and then left to harden, sometimes with the aid of a curing light. The way sealants work is to place a physical barrier between the enamel of the tooth and the cavity-causing bacteria that tend to land and settle comfortably in the pits and grooves present on every molar. Sealants prevent a build-up of plaque on those tooth surfaces and protect them from acids. Sealants are popular because they prevent cavities, thus saving money, time, and the discomfort of dental restorations. Children especially can benefit, since they are generally not as responsible as their parents about taking care of their teeth, especially those hard-to-brush back molars with all their little fissures. Dr. Wojtkun routinely checks the condition of any existing sealants to see if they need to be reapplied, though they will stand up to years of chewing.